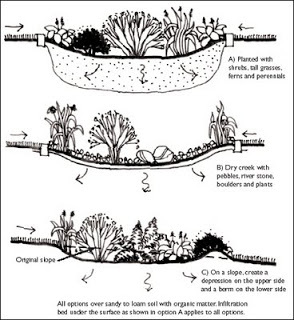 A rain garden allows you to conserve resources by working with nature instead of against it! They can be beautiful, visually interesting features of a home landscape - and can change from season to season. This is one of the most popular requests from my clients - low maintenance gardens. We all want to have more free time, and with a rain garden, the structure of the garden does the work for you! By creating a simple depression in the land - we are setting the scene for a watery oasis every time it rains. Think of the soil as a water filter. By incorporating a rain garden into your property, you can create a new watershed system, that benefits not only the beauty of your property, but also the community. Rainwater can be filtered through rain garden systems, becoming more pure before it eventually is recycled back to us. We can also be actively doing our part to reduce water consumption and utilize naturally occurring rainy weather to nurture your property.